Beeley discussed whether The White Helmets are indeed "independent, impartial and unsullied by Western cash". RT: The White Helmets claim to be a “neutral, impartial, humanitarian NGO". Is that really the case? Vanessa Beeley: It’s impossible for that claim to be legitimate. Let’s take it first of all, “neutral”. They claim that they receive no funding from any governments that have a vested interest in the Syrian conflict. And yet they are in fact multimillion funded, conservatively speaking, 100 million dollars from the US, 23 million via USAID; from the UK around now 65 million - it was originally 19.7 million pounds and Boris Johnson announced a further 32 million. France is supplying equipment. Denmark, Germany, Holland and even Japan through the international agency in Japan. So, it is very hard to comprehend how this organization can describe itself as unaffiliated to government bodies that have an interest and known and declared interest in regime change in Syria. Then if we look at their claims to be neutral, they are embedded entirely in terrorist-held areas whether it is predominantly Al-Nusra front or ISIS or any of the various associated brigades of terrorists that take their command very much from Al-Nusra Front, that is where White Helmets are exclusively. There is massive video and photographic testimonial evidence from inside Syria to give evidence that they are running a terrorist support group. They provide medical care for the terrorists, they funnel equipment in from Turkey into the terrorist areas (…) They’ve been filmed participating and facilitating an execution of a civilian in Aleppo. They post celebratory videos to their social media pages of the execution of civilian Arab soldiers. 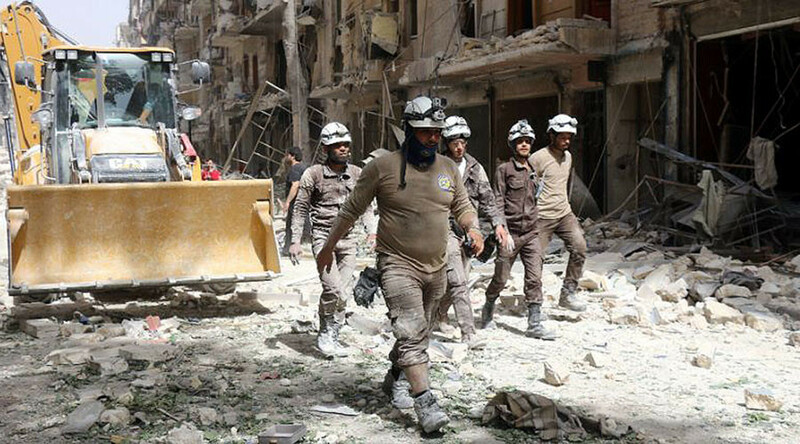 From the testimony from the real Syria Civil Defense across Syria they have also been involved in the taking over of the real Syria Civil Defense units, the stealing of their equipment and the eventual massacres and kidnapping of real Syria Civil Defense crews. RT: Who exactly are its members and its leaders? VB: If we take the leaders, they were both prominent anti-government protesters or demonstrators (...) Raed Saleh was actually deported from the US in April 2016 from Dulles airport. And Mark Toner avoided the questions as to how and why he was deported, while the US is giving 23 million to this organization. He eventually said “because of extremist connections.” In September this year we know that Raed Saleh was allowed back to New York and into the UN and met with Secretary of State John Kerry. But this is not the first time that the United States has allowed terrorist faction leaders in. Labib Al Nahhas was allowed IN December 2015, the leader of Ahrar Al-Sham. It is no stranger to US territory that leaders of terrorist groups or suspect groups are allowed into the US. The trainer of the White Helmets - and this is very important - is an ex British military mercenary, James Le Mesurier, who was given the OBE in June, 2016 by the British government. If we look at his career, and we look at his connections, he connects back to organizations, private security firms, like Blackwater, now called Academi, who, if we remember, were basically a CIA outreach assassination organization that had millions pumped into them by President Bush, and even by President Obama, who gave them over $250 million to continue in their role as assassination experts for the CIA. 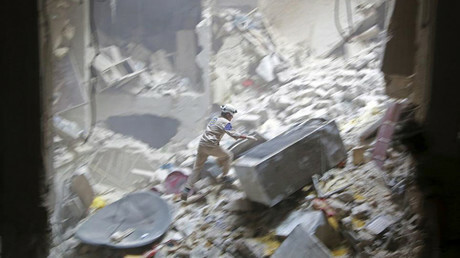 RT: The White Helmets are also referred to as the ‘Syria Civil Defense.’ Is it the same thing? VB: This is a complete criminal and illegal taking of copyright. The real Syria Civil Defense inside Syria has existed for 63 years; the White Helmets have existed for 3 years, they were founded in 2013. What we are seeing here is an eradication of Syrian state institutions and the implantation of a Syrian shadow state by predominantly the UK and the US, but also supported by EU governments.